i-CMiiST featured in Observer (Uganda) – How poetry reduces traffic accidents amongst pupils. Read the article online. New video from Naipolitans Nairobi – The BodaBoda Story. Watch it here. New Critical Mass Cycle Ride Video. Click to watch! Amazing Time-lapse video of Luthuli Avenue, Nairobi during Placemaking week. Watch. Kampala: Zebra crossing installed for safer schools. The I-CMiiST project is funded by the British Academy’s Cities & Infrastructure programme and explores whether more creative co-design methods can reveal alternative more inclusive streetscape options that facilitate safer urban mobility. It is collaboration between creative experts in the UK and East Africa with transport planners and policy makers. 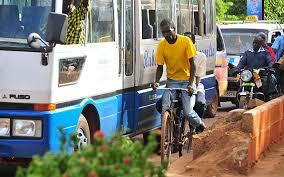 Kampala – congestion near to bus rank.